Powerful Storms Leave At Least 5 Dead In Alabama And Florida : The Two-Way Four people were killed in southern Alabama when a tree fell on their mobile home. One man in the Florida Panhandle drowned. Emergency crews gather after a storm ripped through Rehobeth, Ala., on Monday. 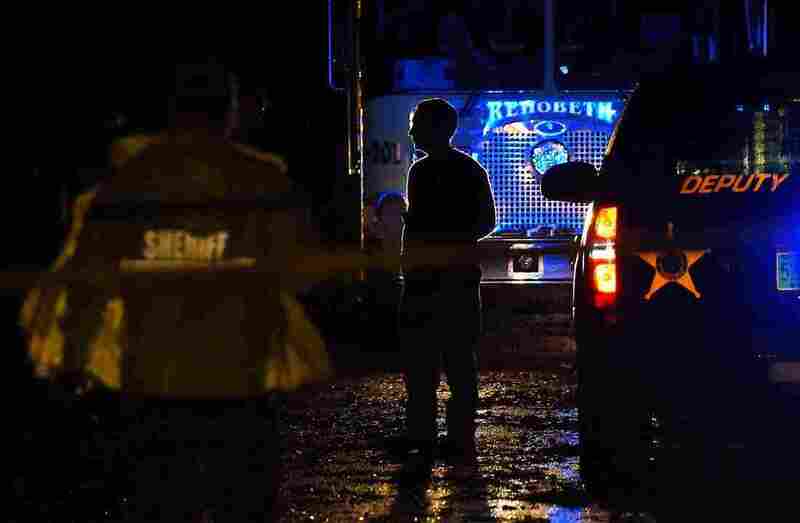 Four people in the small town died when a tree fell on their mobile home. At leave five people have been killed after strong storms pummeled the Southeast on Monday. One man in the Florida Panhandle drowned. And four people died in southern Alabama when a tree fell on their mobile home. "The local emergency management agency says a tornado touched down nearby, tearing up trees and blocking roadways. With the severe weather through, officials are now warning of flooding as some areas saw as much as 5 inches of rain." Flash flooding along creeks and rivers remained a danger. The National Weather Service issued flood warnings for some areas in Alabama on Monday and they remained in effect as of Tuesday morning. Alabama Gov. Robert Bentley tweeted Monday night about the storms and offered "prayers for those impacted." In Florida, the Walton County Sheriff's Office said in a statement that deputies discovered the body of William Patrick Corley, 70, floating facedown Monday near his home in Mossy Head and that his car was partially submerged. Just spoke w/ Houston Co Sheriff Donald Valenza. Confirmed 4 fatalities in one structure in Rehobeth area. Prayers for those impacted today. "The system knocked out power to more than 80,000 customers in Louisiana and Mississippi at the peak of the storm Monday. Trees were downed or buildings were reported damaged in 18 counties in Mississippi, 15 parishes in Louisiana and 15 counties in Texas. No injuries or deaths have been reported in Louisiana and Mississippi." Yeager reported that the rains were welcomed in Alabama, as the state deals with "a persistent drought." But he said that even with all the rain, "96 percent of Alabama is still considered under drought."